(the month of Ab; Sanh. 12a). "A pair [of disciples], coming from Raḳḳat [Tiberias; see Meg. 6a], were apprehended by the Eagle [Romans], because in their possession they had fabrics from Luz [blue or purple yarn for fringes, the ẓiẓit]. By the grace of the All-merciful and through their own merits they escaped. Also, the burden-bearers of Nahshon [the diviner: the commission appointed by the patriarch] desired to establish a guard [an intercalary month], but the Arameans [Romans] would not permit them. However, the commanders of the gathering [leaders of the council] convened [another time] and established a guard in the month in which Aaron the priest died"
Almost the whole Diaspora depended for the legal observance of the feasts and fasts upon the calendar sanctioned by the Judean Sanhedrin; yet danger threatened the participants in that sanction and the messengers who communicated their decisions to distant congregations. 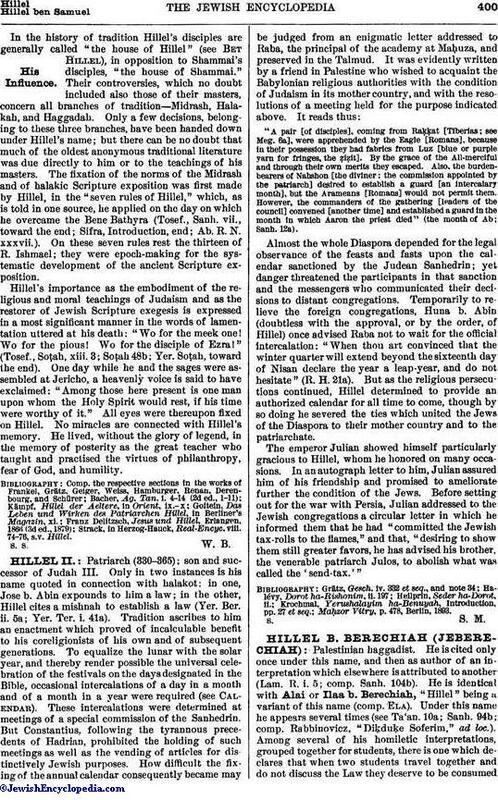 Temporarily to relieve the foreign congregations, Huna b. Abin (doubtless with the approval, or by the order, of Hillel) once advised Raba not to wait for the official intercalation: "When thou art convinced that the winter quarter will extend beyond the sixteenth day of Nisan declare the year a leap-year, and do not hesitate" (R. H. 21a). But as the religious persecutions continued, Hillel determined to provide an authorized calendar for all time to come, though by so doing he severed the ties which united the Jews of the Diaspora to their mother country and to the patriarchate. The emperor Julian showed himself particularly gracious to Hillel, whom he honored on many occasions. In an autograph letter to him, Julian assured him of his friendship and promised to ameliorate further the condition of the Jews. Before setting out for the war with Persia, Julian addressed to the Jewish congregations a circular letter in which he informed them that he had "committed the Jewish tax-rolls to the flames," and that, "desiring to show them still greater favors, he has advised his brother, the venerable patriarch Julos, to abolish what was called the 'send-tax.'" Maḥzor Vitry, p. 478, Berlin, 1893.